A stroke is the condition in which part of the brain abruptly loses its source of nutrients, oxygen and glucose, that are normally delivered to it by way of the vascular system. Normally, with each beat, the heart pumps blood into its major outflow artery called the aorta. The brain is the hungriest and is constantly using these two essential ingredients to fuel its tangled factory of nerve cells and their connections. Any caused can make part of the brain loses source of nutrients, oxygen and glucose. Deprive the brain of this fuel for even a few moments and a person will rapidly lose consciousness. When a person has a stroke, one specific area of the brain stops getting enough of these nutrients. Within seconds to minutes, that specific part of the brain stops functioning properly. Like the word implies, this occurs instantly, in the stroke of almost a second. The three elements that are common to a stroke are as follows: (1) abrupt onset of focal neurological symptoms, (2) symptoms that can be attributed to losing blood flow in a single artery’s territory, and (3) symptoms that last for at least twenty-four hours.There is a condition would happened before a stroke rise. This disturbance is transient ischemic attack (TIA). A TIA has both the first two elements of a stroke, but the duration of the symptoms is less. Therefore, a TIA is defined as follows: (1) abrupt onset of focal neurological symptoms, (2) symptoms that can be attributed to losing blood flow in a single artery’s territory, and (3) symptoms that last for less than twenty-four hours. There are different kinds of strokes, and this does not just refer to causes. Doctors make a major distinction between ‘‘ischemic’’ and ‘‘hemorrhagic’’ strokes. 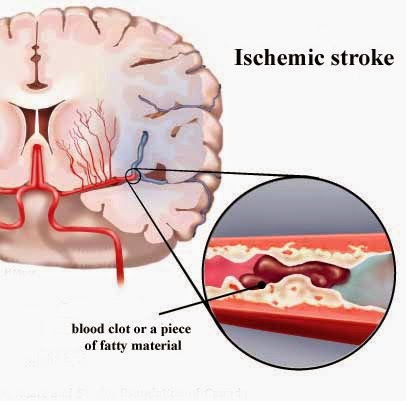 An ischemic stroke is one in which a solid blood clot blocks the flow of blood in an artery to the brain. This clot obstructs the flow of blood so that any brain tissue that normally is fed by this artery is deprived of the nutrients (oxygen and glucose) that are normally supplied. A hemorrhagic stroke is one in which a blood vessel bursts and the blood creates pressure on the brain. Ischemic stroke, strokes caused by clots that block blood flow, is by far the most common and accounts for approximately 80 percent of all strokes. There are a number of subtypes of ischemic stroke. That are embolic, large vessel atherosclerosis, small vessel “lacunar disease”, and others (arterial dissection, hypercoagulable, venous sinus, thrombosis, vasculitis etc). Risk factor of embolic stroke : atrial fibrillation, atherosclerosis of the aorta and carotid arteries, heart attack, cardiomyopathy, left ventricular aneurysm, PFO, and endocarditis Risk factor of atherosclerosis : cigarette smoking, high blood pressure (or ‘‘hypertension’’), diabetes sedentary lifestyle, and elevated blood lipids (such as cholesterol and ‘‘triglycerides). Beside genetic factors play a role as well. Risk factor of elevated lipid : cholesterol and triglycerides in the vessel Risk Factors for Large-Vessel and Small-Vessel Disease : Diabetes, hypertension, cigarette smoking, elevated cholesterol and triglycerides, carotid artery stenosis, sedentary lifestyle, genetic factors, age. Hemorrhagic strokes account for the remaining 20 percent of strokes, and, again, several subtypes exist.That are amyloid angiopathy, hypertensive bleeding, ruptured abnormal blood vessels, aneurysm, arterio-venosus malformation, and others (venosus sinus thrombosis, arterial dissection, coagulopathy, vasculitis, etc). Other miscellaneous blood vessel abnormalities. A stroke involving the right side of the brain will result in a deficit of the left side of the body, and a stroke involving the left side of the brain will affect the right side of the body. So the symptoms in any individual patient are mostly affected by which artery is involved and which side of the brain is involved. The majority of these cables of nerve fibers cross in the brainstem, a portion of the brain that connects the upper brain (cerebrum) to the spinal cord. The brainstem contains many cells of the nerves called the cranial nerves. These nerves, for the most part, supply motor and sensory function to various structures in the head and upper neck. A stroke that occurs in the brainstem may affect the face and neck on the same side as the stroke but the arms and legs on the opposite side. A stroke of the cerebellum usually affects the same side of the body. Although this can get confusing, it is not important to know the details at this point. What is important is to know that the specific parts of the body that are involved give important clues about what portion of the brain is affected. With that background, we can now talk about stroke symptoms. The third important fact is that different lobes of the brain are the centers for different functions. For example, the frontal lobes are relatively silent in terms of acute stroke symptoms, at least with regard to weakness or sensory findings. The right parietal lobe tends to be important with spatial relationships, whereas its counterpart on the left is the speech center. The back part, or occipital lobes, is important for vision and interpreting what we see. The cerebellum is the center of balance; as you might imagine, this part of the brain is very well developed in cats and birds. In an ischemic stroke, a clot blocks flow of blood distal to where the clot sits. The portion of the brain that normally received nutrients from the artery stops functioning. Therefore, whatever functions that part of the brain controls instantly stop. So if a person were to have a clot lodge in the right middle cerebral artery, they would have the onset of left-sided weakness and numbness. Because this part of the brain is also responsible for spatial relations, sometimes these patients will not recognize someone standing to their left. In addition, they may awake lying in the bed diagonally. A clot blocking flow to the left middle cerebral artery would lead to right-sided weakness and problems with speech, because the left brain is largely responsible for language. This loss of ability to speak is called aphasia. A stroke of the cerebellum will lead to imbalance and vertigo, the illusorysense of motion in the environment. If large enough, the patient’s balance can be so poor that they cannot walk at all. Because the cerebellum lies in a very small and constrained portion of the brain, the posterior fossa, headache is common with this kind of stroke. A stroke involving the anterior cerebral artery would preferentially affect the leg more than the face or the arm because that vessel supplies blood to the middle portion of the brain, where the leg is mostly represented on the homunculus. Thus, a left anterior cerebral artery stroke might involve the right leg more than other body parts on the right. Because strokes are more important in older patients, the person’s age is of obvious significance. The paramedics, nurses, and doctors will all try to piece together what the specific symptoms are, precisely when they started, how they evolved, what the patient was doing at the onset, and all of the other relevant details of the event. Essentially, they are trying to exactly recreate the sequence of events. Seemingly minor details can be very important in this part of the history. For example, did the patient go to sleep normal and then wake up with rightsided weakness? If so, how long did they sleep? Did the left-sided facial droop precede the left arm weakness by thirty minutes or did both start together? Has this patient with a migraine headache ever had double vision with a previous migraine or not? In fleshing out the story here, the doctor is acting like a detective, trying to get all the facts to sort out which are relevant and which are not. In many ways, this process of differential diagnosis is much like a policeman trying to solve a crime. Doctors will ask about associated symptoms. For example, the presence of fever suggests the possibility of a heart infection called endocarditis that might have caused an embolism to the brain. The fever also alerts the clinician that perhaps this is some sort of infection that is unmasking an old stroke. Any associated symptoms could be significant. Shortness of breath might indicate heart failure or pneumonia. Neck pain could indicate a dissection of one of the arteries that lead into the Circle of Willis. Vomiting, double vision, or vertigo suggests a stroke in the cerebellum or brainstem. A severe headache could indicate a subarachnoid hemorrhage, among other possibilities.